Download "ZA5785. 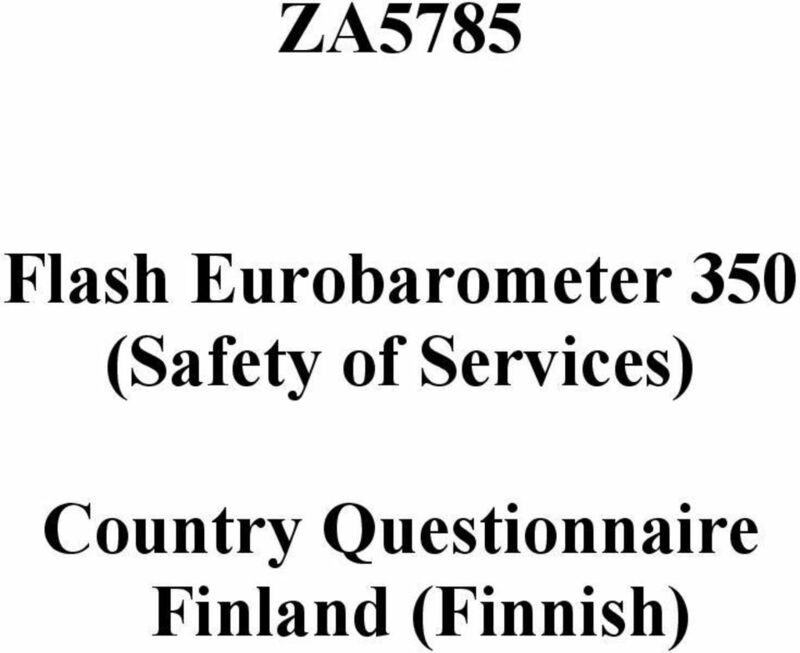 Flash Eurobarometer 350 (Safety of Services) Country Questionnaire Finland (Finnish)"
ZA686 Flash Eurobarometer 6 (The Charter of Fundamental Rights of the European Union, wave ) Country Questionnaire Finland (Finnish) FL6 Charter of Fundamental Rights of the EU - FIF D Minkä ikäinen olette? ZA68 Flash Eurobarometer 0 (Citizens Perception about Competition Policy, wave ) Country Questionnaire Finland (Finnish) FL 0 - EU citizens' perceptions about competition policy - FIF D Minkä ikäinen olette? 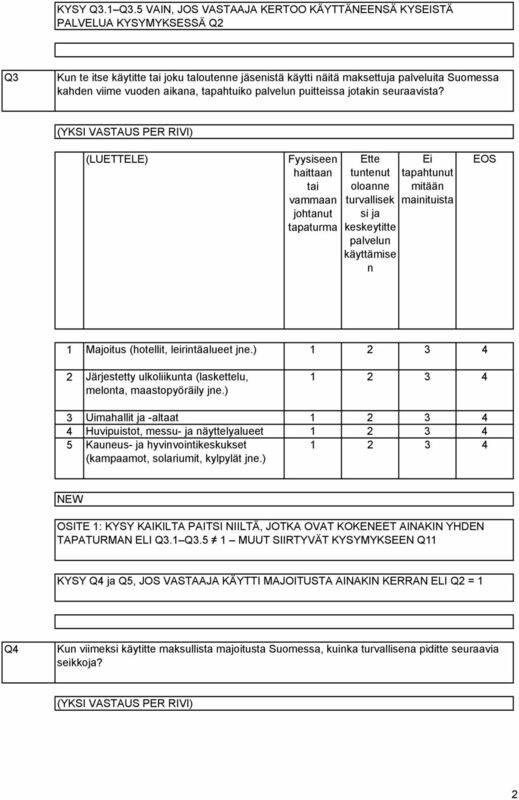 ZA5443 Flash Eurobarometer 294 (European Union Citizenship) Country Specific Questionnaire Finland FLASH EUROBAROMETER ON CITIZENSHIP OF THE EUROPEAN UNION Q1. Tämä tutkimus koskee Euroopan unionin kansalaisuutta. 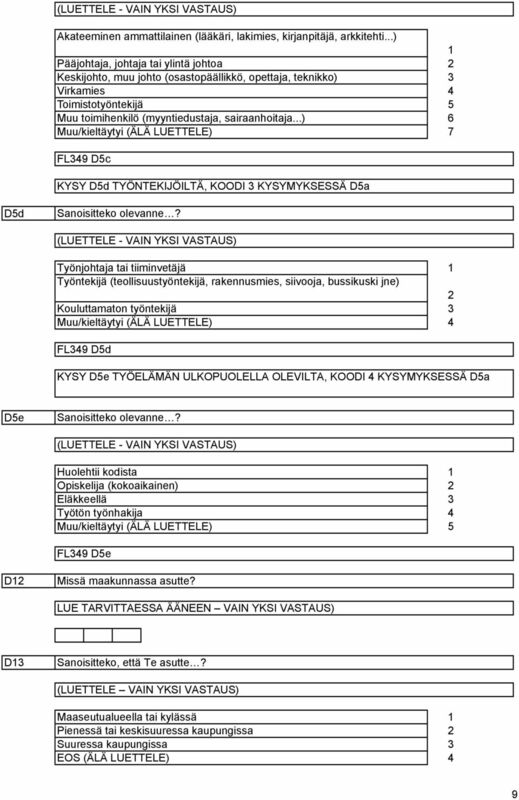 ZA4735 Flash Eurobarometer 219 (Biodiversity) Country Specific Questionnaire Finland Flash Eurobarometer on biodiversity Flash 219 questionnaire Q1. 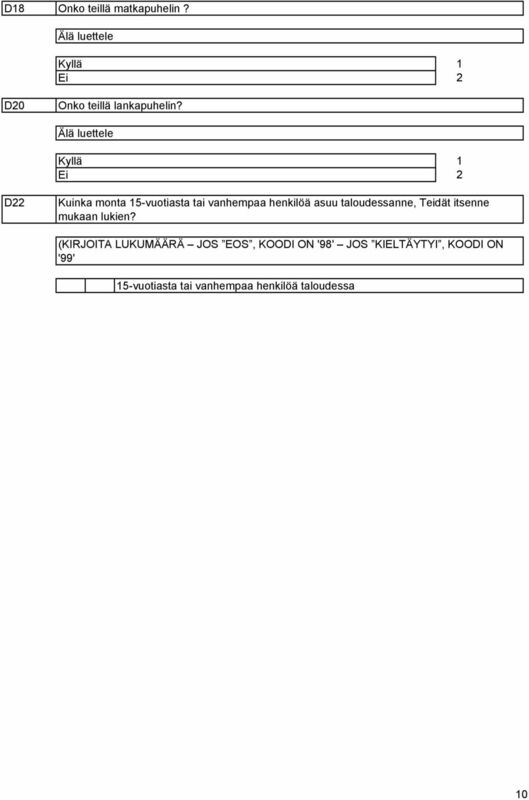 Oletteko tietoinen ilmaisusta biologinen monimuotoisuus? 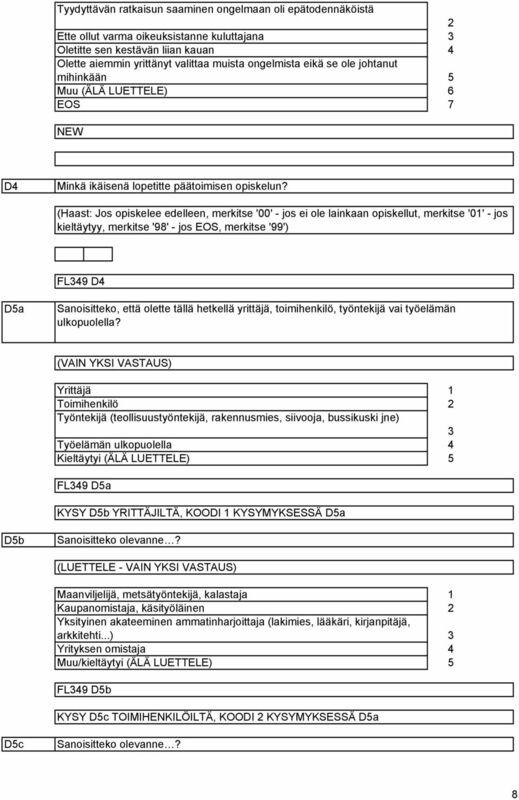 ZA4535 Flash Eurobarometer 188 Consular Protection and Family Law Country Specific Questionnaire Finland Flash 188 : Family law & Consular protection D(7599) DG JAI 2006, Draft Questionnaire v2.1 INTRO. ZA79 Flash Eurobarometer 60 (Attitudes of Europeans towards Air Quality) Country Questionnaire Finland (Finnish) EB FLASH 60 - Attitudes of European towards water related issues - FIF D Minkä ikäinen olette? ZA596 Eurobarometer 8. 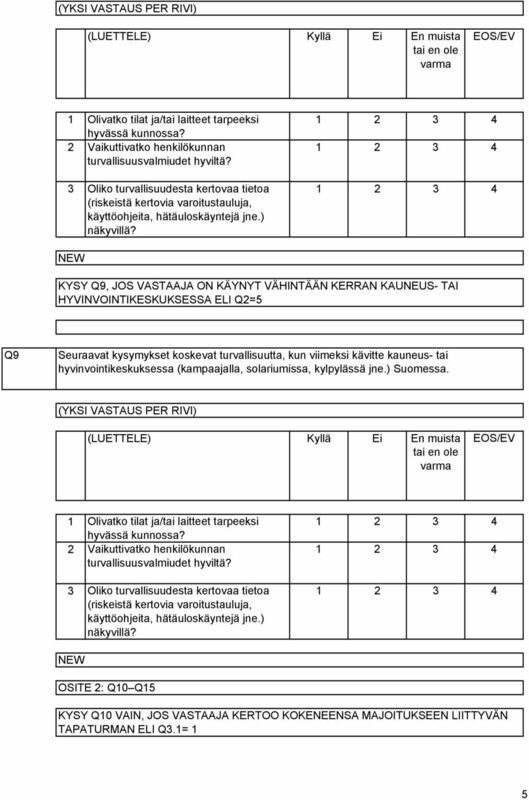 Country Questionnaire Finland (Finnish) A Työnumero EB8. A B Maakoodi EB8. B C Kyselynumero EB8. C D Lomakenumero EB8. D QuestioEB8COMMcompletFIF /7 0/0/05 Q Mikä on kansallisuutenne? 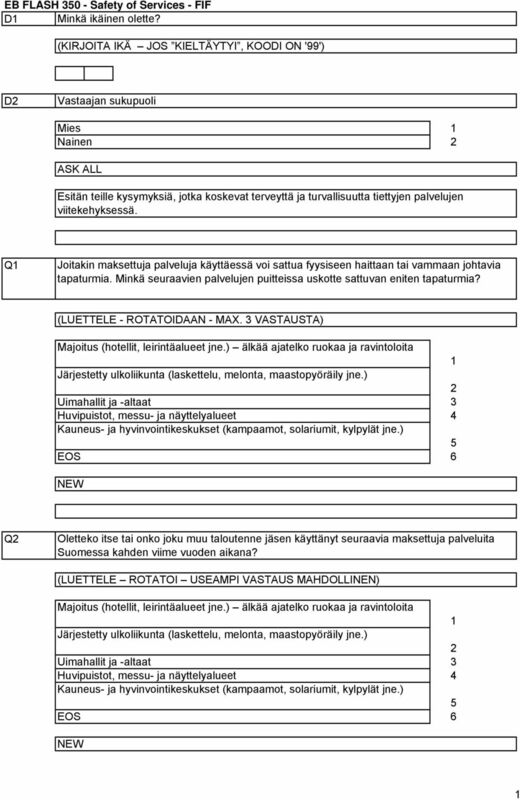 ZA4983 Flash Eurobarometer 256 (Europeans attitudes towards the issue of sustainable consumption and production) Country Specific Questionnaire Finland FLASH 256 SUSTAINABLE CONSUMPTION & PRODUCTION Q1.